A report by a task force set up by NITI Aayog has suggested that all permit requirements be removed for electric vehicles in India. The report says that this measure will be especially useful in a long-term vision for intra-city electric buses, making the process of acquiring such buses less bureaucratic.The report also states that the two-wheeler and three-wheeler market has huge potential for adopting EV technologies and these sections of the auto industry should be specifically targeted for large-scale adoption of electric vehicles. It also proposes restraining high-mileage polluting vehicles, improved enforcement of the Pollution-Under-Control (PUC) regime, permit retailing of biofuels, and promotional activities to increase awareness about electric-mobility. Additionally, the report by the NITI Aayog task force addresses important issues like banning of vehicles older than 20 years and allowing the traffic police greater powers to authorize them to lift and scrape non-compliant vehicles. Further, another task force by the NITI Aayog in a report titled 'Action Plan for Clean Fuel' has pointed out that taxation and pricing strategy are essential tools to provide impetus to the use of cleaner fuels in the country and discourage the use of polluting ones. 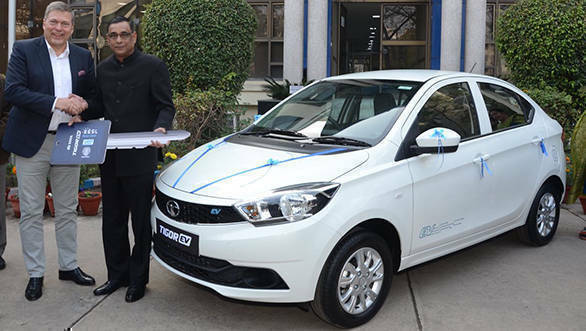 EESL's recent order of 10,000 cars is another positive step in the growth of electric mobility in the country. The electric vehicle industry has welcomed these recommendations. Mr Ayush Lohia, CEO, Lohia Auto Industries stated that NITI Aayog's proposal is in sync with government's aim to make India a 100% electric vehicle nation by 2030 as these vehicles not only help users save money, but also promote a safe and clean environment which is a big health concern today. He went on to say that this action plan will prove to be beneficial for both consumers and the nation in the long run. The NITI Aayog is a policy think-tank of the Indian government that aims to achieve sustainable development targets and enhance co-operation between the central and state governments in the economic policy-making process.